I am offering this column to share tidbits of information, interesting examples of equipment variations and modifications, and period photographs of military subjects with the collecting community. If you have period photos of your military fore bearers or an interesting artifact you’d like to contribute, please let me know. I will either credit the material to you, or protect your identity, as you see fit. At this time, my intent is to post new material on a monthly basis, however if the volume of your contributions warrants more frequent postings, I will make every effort to fit them all in, while still giving you the opportunity to view the new postings before they change. With project timelines, schedules and the overall commitment of preparing this website for its maiden voyage, I haven’t had much of an opportunity to dedicate the additional time to this column to prepare for its first edition. I delegated the task to my sole employee, Festus. As I am sure you will learn in future columns, Festus is neither the most industrious nor the most attentive of employees. This could have much to do with his low birth and slow motion parents. Festus continually points out however, that being computer literate was never part of our contract and on that point I have no valid argument. Needless to say, he had done little to advance this part of the project beyond what I left him with. So, I decided to share this cartoon I found in my father’s personal papers after his passing. 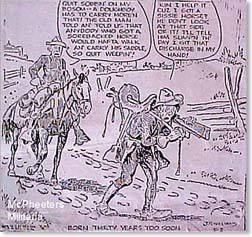 It is fair to say that Dad was a soldier all of his adult life, beginning his career in the horse cavalry in the 1930’s, so while it is impossible for me to date this cartoon, I think it’s safe to say the message was one he understood and concurred with completely. 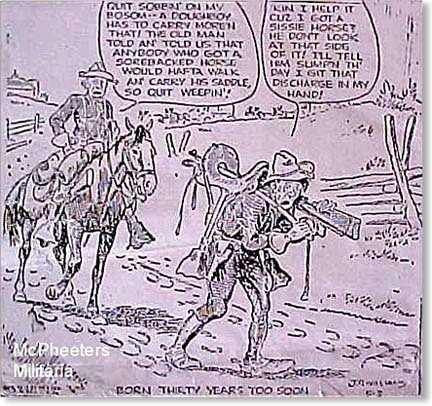 A bit of “old Army” humor. Check back soon and I’ll start posting some of the images and descriptions of items I’ve been fortunate enough to enjoy through the years. Hope this finds you well and enjoying the beginning of autumn. In South Texas we have to pay close attention to see the change – the subtleties of spring and fall down here are often lost on the casual observer. Going straight to the depth of winter from the highs of summer is not uncommon.